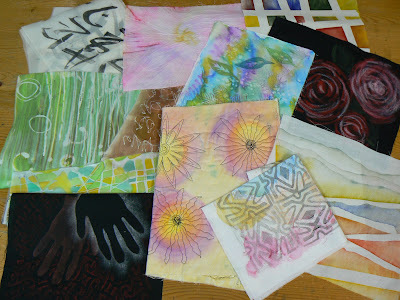 Fabric Painting 3 Ways: This is a class in surface design. We'll be creating patterns on commercial cotton and silk with three very different kinds of paint: Shiva paintsticks, Neocolor II watercolor crayons, and Dye-na-Flow silk paints. Neocolor IIs are watersoluble wax crayons that work like watercolors on paper or fabric. They are easy to use and to clean up and give great results with minimal drawing experience. Shiva Paintstiks are oil paint in stick form. They can transform commercial cotton fabric into one of a kind material for your art quilt, mixed media piece or collage. Dye-na-Flow silk paints offer intense color and are easily heatset with an iron. We'll experiment with all three of these paints, using stamps, stencils, rubbings, resists and other techniques, on both cotton and silk, to make a fabulous collection of patterned fabrics that you can use in a whole range of projects. And you get to take home starter sets of each kind of paint! There are still a few spots left in this class. Click HERE to register for this full-day class scheduled for Thursday, August 4. 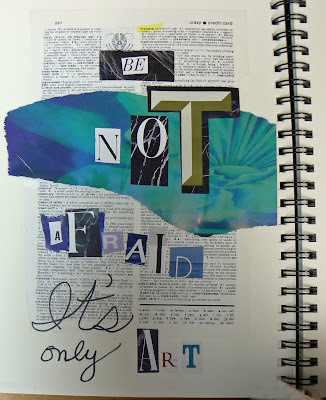 Art Journaling to Kickstart Creativity: This is a full-day expanded version of my Design Kickstarters class. It's designed to get you comfortable with using a sketchbook or visual journal to capture and develop inspirations for your textile projects. Learn how to get around the fear of the blank page and generate quick compositions that can be the start of a new design. No drawing experience needed! Get acquainted with the essential elements of art and design and do hands-on exercises to learn how to make them work for you. We'll also cover how to use photographs as sources of imagery. This class is all about the playful exploration of possibilities. Several spots still available in this class; click HERE to register. It's taking place on Friday, August 5. 6/1/2016 UPDATE: Collaging Convergence has been cancelled due to low enrollment. But there's still room in the two classes above! Collaging Convergence: I thought up this class as a fun way to cap off your week at Convergence. Bring the goodies you've collected during the conference, combine them with mixed media materials and papers I'll provide, and make a collage that will encapsulate your experience. You can choose to make a mailable postcard or a larger piece that becomes a lasting memento. Learn tips that make collages visually exciting--there's more to it than just gluing a bunch of random stuff down on a page! 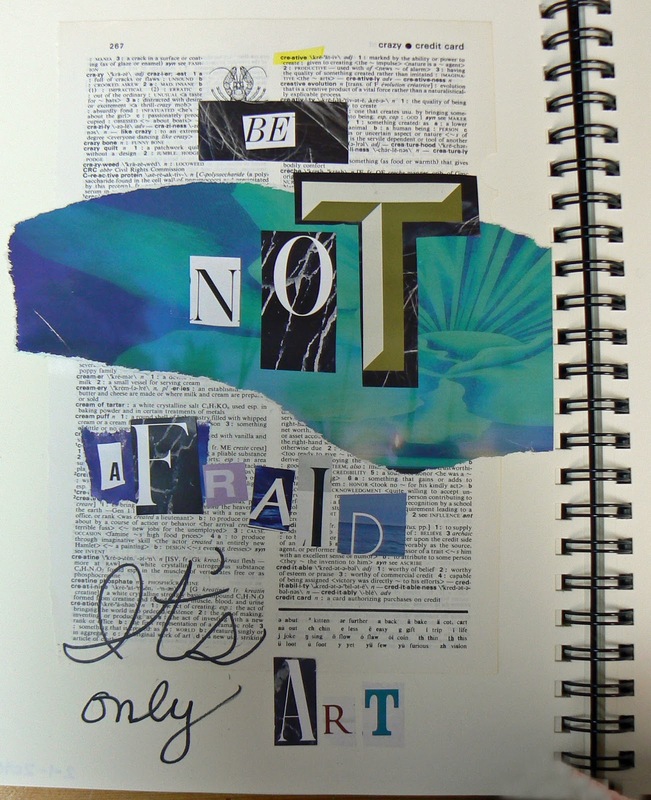 Discover how to use collage as a strategy for generating designs--and how to elevate it to create a true work of art. 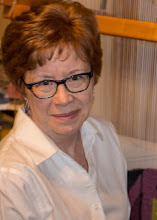 This 3-hour class takes place on Saturday, August 6. Yesterday I was at the grocery store, shopping for a Valentine's Day card for my dear husband, when my eye fell on this one, labelled "hangable weaving." Those of you who hang out on Pinterest will recognize the style. There's a type of tapestry weaving that's very hot these days, featuring white backgrounds, simple shapes in pastel hues, and fringe, lots of fringe. This little weaving does have a tiny dowel rod at the top, so I suppose it is "hangable." 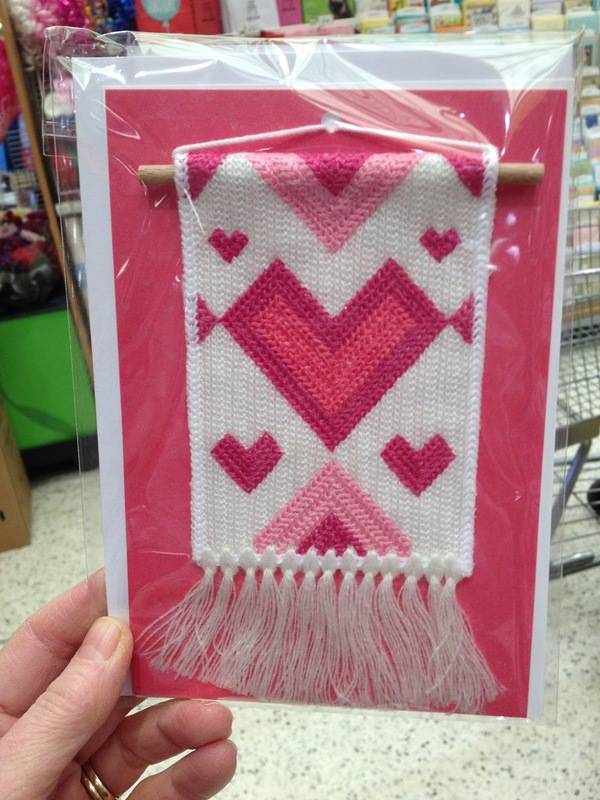 But on closer inspection, it's not "weaving" at all. It's machine-knitted, at least the background is. 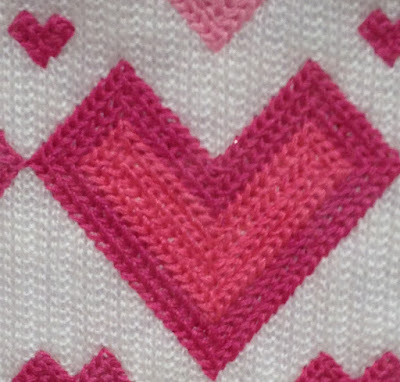 The heart motifs may also be machine-knit, or possibly machine embroidered; it's hard to tell. I couldn't bring myself to plunk down $7.99 so I could bring it home and take it apart. But I can assure you there is no weaving here. Weavers of the world, we have our work cut out for us! Here's one way. If it looks like a PowerPoint slide, that's because it is. 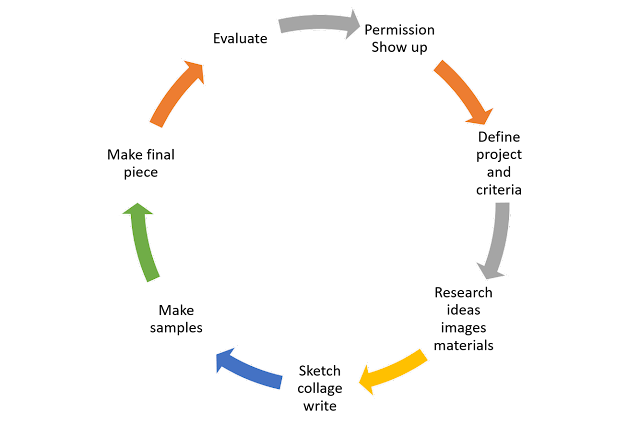 * If you start at 1:00 on the circle, you see how you start by giving yourself permission to try--to carve out the time, find the materials, use them (even "waste" some), fail, try again. You show up to the studio or wherever you make stuff, even if all you have is 20 minutes. You get the idea. Each step follows, one leading neatly (?!) to the next. 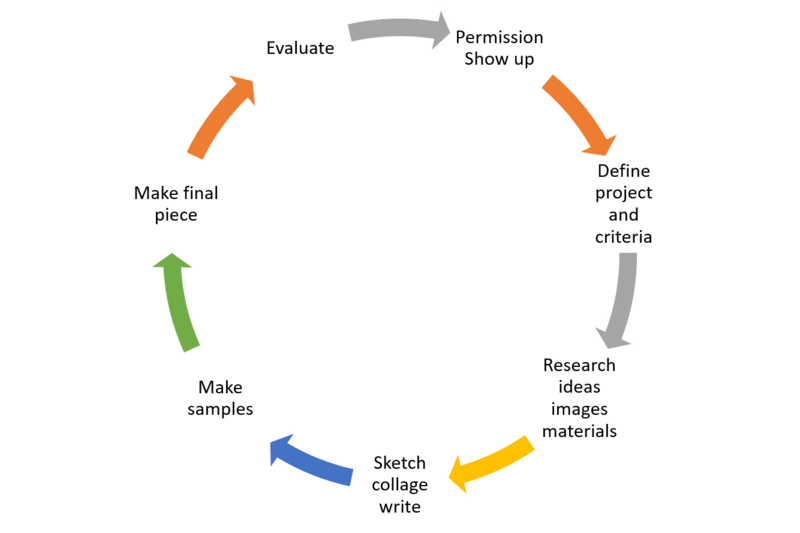 You get that it's more a circular than a linear process, though, that continues on around, revisiting some stages, until you collapse from exhaustion the piece is finished. In my experience these views are both accurate. 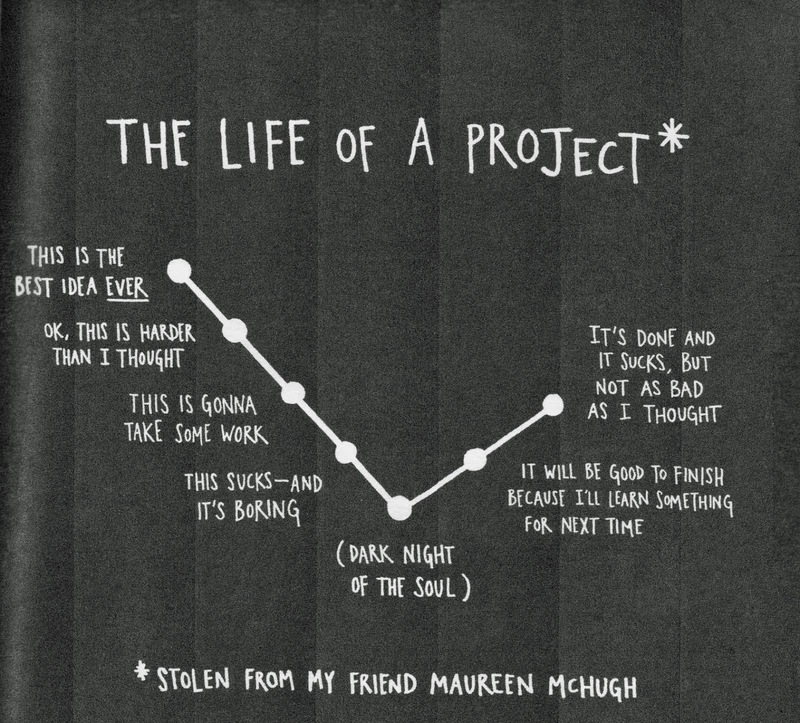 The design process is sort of like riding a roller coaster. You strap yourself in, hold on, scream, almost wet your pants with fear and excitement, wonder why you ever decided to do this, swear never to do it again. Then it's over, and you get off, exhilarated and ready to do it again. Come explore the ins and outs and ups and downs with me. 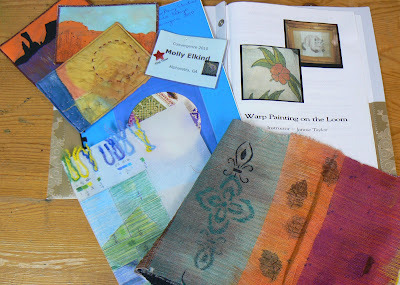 *It's from my Design Process: Inspiration to Roadmap class, next Tuesday at Chattahoochee Handweavers Guild. Click HERE to register.